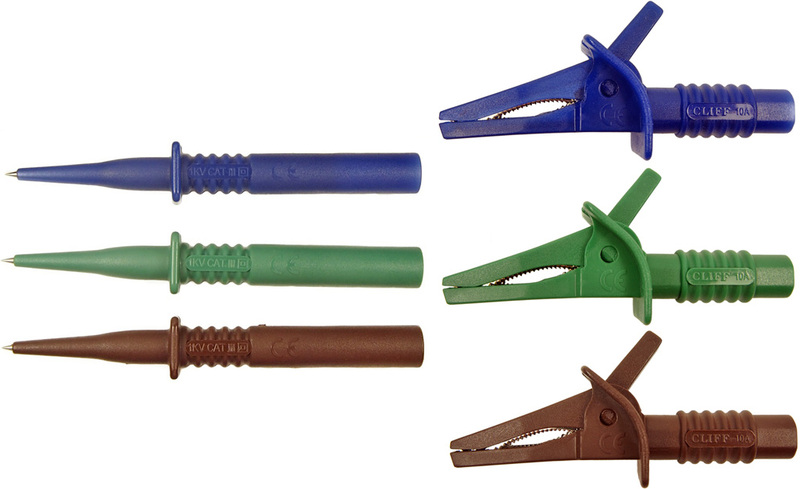 Our range of durable crocodile clips are made from high grade engineering plastics, with tin or nickel plated metal parts. Most comply with EN61010 / CE. 4mm socket at rear accepts shrouded plug or unshrouded probe. Tongue at front to catch small wires or conductor pins. Jaws open to 25mm. Basic rating 600V CAT III, (1000V CAT II). EN 61010-1 compliant. Available in black, red, green, blue, brown, yellow and green / yellow. CRC/01X Extended rear shroud version of CRC/01. The shroud enables the highest rating to be maintained. 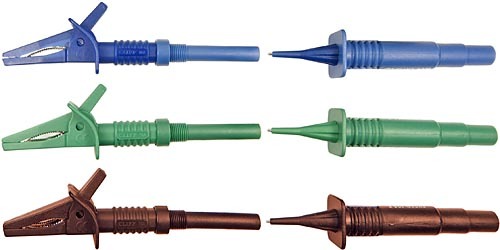 For use with probes TPR/1 or TPR/1C. Curved jaws give good grip on busbars. Jaws open to 25mm. Basic rating 600V CAT III, (1000V CAT II). EN61010-1 compliant. 4mm socket at rear accepts shrouded plug or unshrouded probe, depending on model. Tongue at front to catch small wires or conductor pins. Jaws open to 28mm. Basic rating 1KV CAT III. Current rating 20A. EN 61010-1 compliant. Available in black, red, green, blue and brown. FCR79900B black 4mm socket accepts shrouded plug. FCR79900R red 4mm socket accepts shrouded plug. FCR79900G green 4mm socket accepts shrouded plug. FCR79900L blue 4mm socket accepts shrouded plug. FCR79900N brown 4mm socket accepts shrouded plug. FCR79910B black extended rear shroud version for use with unshrouded plug. FCR79910R red extended rear shroud version for use with unshrouded plug. FCR79910G green extended rear shroud version for use with unshrouded plug. FCR79910L blue extended rear shroud version for use with unshrouded plug. FCR79910N brown extended rear shroud version for use with unshrouded plug. Used in applcations where access is restricted, especially telecommunications. 4mm socket at rear accepts shrouded or unshrouded plugs. Rated 300V CAT II. EN 61010-1 compliant. CRC/M All-metal, uninsulated crocodile clip generally used for earth ground testing. Curved jaws give good grip on busbars. Jaws open to 25mm. A PVC boot in black or red is available as an option. 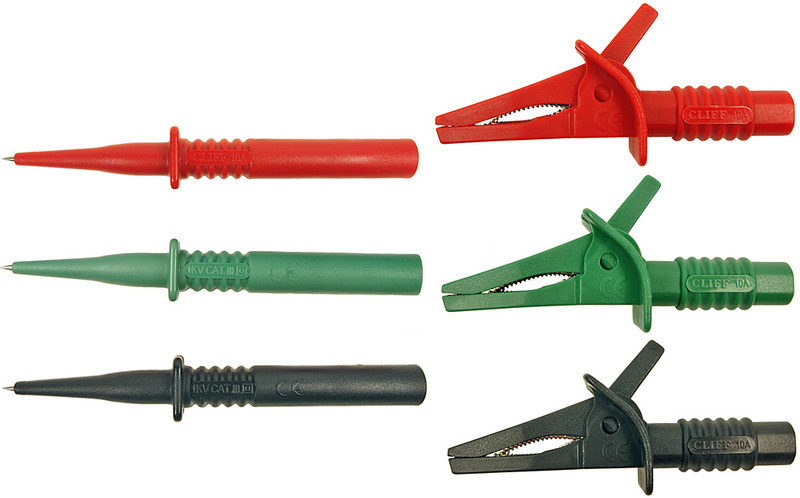 CRC/BON “Bed of Nails” crocodile clip with insulation piercing point. Mostly used in telecoms testing. Optionally available with just the piercing point. A range of coloured colored PVC boots is available. CIH29880 Set of three unfused probes and crocodile clips. Blue, Green, Brown. Other colour color combinations available, subject to viable quantity. CIH29881 Set of three unfused probes and crocodile clips. Black, Red, Green. CIH29885 Set of three fused probes and crocodile clips. Blue, Green, Brown. CIH29886 Set of three fused probes and crocodile clips. Black, Red, Green.